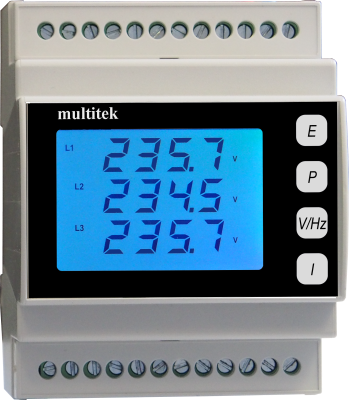 The M801 and M802 are compact 96 x 96 mm Din cased, LCD, RMS sensing, three phase power meters with the option of RS485 communications and pulsed output. They measure Volts, Amps, Frequency, Active Power and Apparent Power. The M802 also measures Reactive Power, Active Energy, Reactive Energy, Power Factor, Amp Demand, Apparent Power Demand, Active Power Demand, Maximum Amp Demand, Maximum Apparent Power Demand and Maximum Active Power Demand. 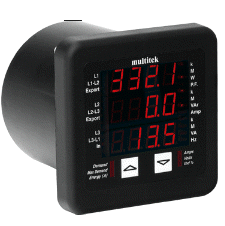 The M812 is a compact 96 x 96 mm Din cased, red LED, RMS sensing, three phase power meter with the option of RS485 communications and pulsed output. The M812 also measures Reactive Power, Active Energy, Reactive Energy, Power Factor, Amp Demand, Apparent Power Demand, Active Power Demand, Maximum Amp Demand, Maximum Apparent Power Demand and Maximum Active Power Demand. MultiRail M880 is a low cost DIN rail-mounted, three phase power meter. It measures line Voltages, line Currents and line Powers, Neutral Current, System Frequency, System W, A and VA Demands, System W, A and VA Maximum Demands, System Active Power, System Reactive Power, System Apparent Power, System Active Energy, System Reactive Energy and System Power Factor. It features a 100V-400V ac/dc power supply input, seven colour LCD backlight, pulsed outputs and an RS485 port using a subset of Modicon's Modbus protocol. The integrated solid-state relay can have up to 8 conditions attached to it creating a very flexible monitoring system. 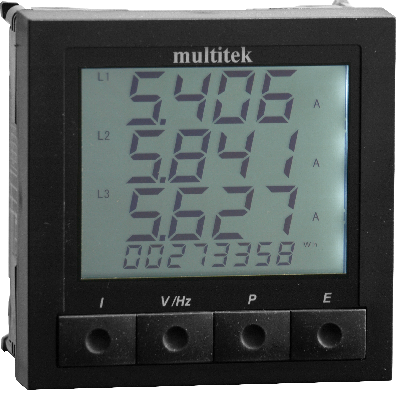 The M850 is a 96 x 96 mm Din cased, blue or red LED or LCD, three phase (RMS sensing) or DC power meter with the option of RS485 communications and pulsed output. It measures Volts, Amps, Frequency, Active Power and Apparent Power, Reactive Power, Active Energy, Reactive Energy, Power Factor, Amp Demand, Apparent Power Demand, Active Power Demand, Maximum Amp Demand, Maximum Apparent Power Demand and Maximum Active Power Demand. 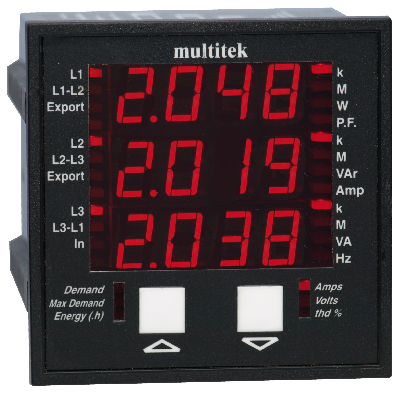 MultiDigit M842 three phase, RMS sensing, LED power meters are housed in round barrelled, square fronted cases. They measure Volts, Amps, Frequency, Demands, Maximum Demands, Active Power, Reactive Power, Apparent Power, Active Energy, Reactive Energy, Real Power Factor and THD on voltages and currents. They feature the option of pulsed output and an RS485 port using Modicon's Modbus protocol. Their accuracy is class 0.2% for input signals down to 10% Un and 10% In, (1% of reading for energy measurements. IEC1036), 50-60Hz. 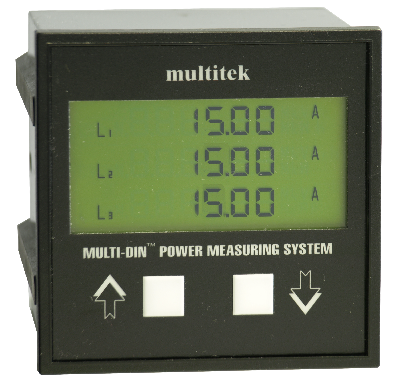 The MultiPanel is a low cost three phase, average sensing, digital meter in a standard DIN 96 x 96 mm case, measuring basic electrical parameters. The standard unit can be used on any wiring system and any voltage between 10V to 415V LN (17V to 720V LL) The MultiPanel is simple to use and is an ideal replacement for analogue meters.